'Billionaire' (Monty Byers, R. 1986). Seedling# C64-104. TB, height 32" (81 cm), Early midseason to midseason bloom and rebloom (September in California). 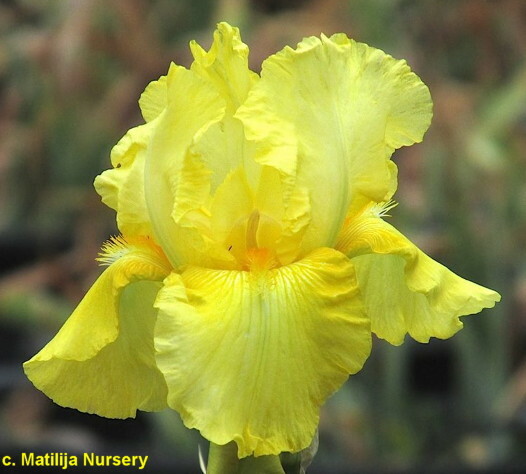 Lightly ruffled bright yellow gold; yellow orange beard; slight musky fragrance. 'Corn Harvest' X seedling# A-14-2: ('Moon Mistress' x 'Replay'). Moonshine Gardens 1987. From AIS Bulletin #265 April 1987 Introducing BILLIONAIRE (Byers '86) Sdlg. C64-104: Corn Harvest x (Moon Mistress x Replay).TB, 32", EM-M & RE. Bright yellow-gold with tangerine-orange beards. Nice lightly ruffled flowers with very rich coloring. Best form of 18 reblooming seedlings from this cross and is among the very earliest and strongest with its rebloom of these sibs. Usually starts in September here and keeps going 'til cold enough weather finally stops it. Lots ofshorter well branched and budded stalks both spring and fall. Extremely strong vigorous grower. I haven't used it yet but will this spring. $25.00. Moonshine Gardens.